If you’ve ever had one of these stuck to your clothes or your pet’s fur, you’ve encountered this plant. Burdock (Arctium minus, A. lappa) is an escaped domestic vegetable, cultivated for thousands of years in Japan. Here, it’s an introduced species and considered a weed, but soon you’ll think otherwise. Budock is fairly easy to identify. Have you ever been walking on a path and thought, “My, there’s a lot of rhubarb here!”? 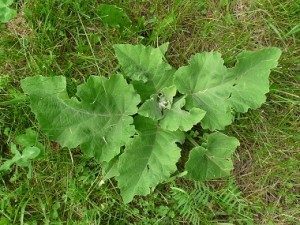 If so, you were probably looking at burdock, which looks similar to rhubarb, except the leaves of burdock are not glossy, have wool underneath, and have smoother petioles. This herbaceous biennial plant is a low-growing rosette of basal leaves during the first year, but during the second year it becomes 3-6′ tall. The second-year plant is little branched below, but produces short flowering side stems above. The stems are rather stout, round or slightly ridged in circumference, and light green to slightly reddish green. Young stems are covered with white cobwebby hairs, but older stems become glabrous and have conspicuous longitudinal veins. The basal leaves are up to 2′ long and 1½’ across. They have long petioles and resemble the leaves of rhubarb to some extent. The lower leaves of second year plants resemble the basal leaves, except that they are somewhat smaller. These leaves are ovate-cordate, dull green above, and whitish green below, with blunt tips. They are nearly glabrous above, but finely pubescent below. Their margins are somewhat undulate, crisped, or smooth, sometimes with a few blunt teeth. Their long petioles have a conspicuous furrow above and they are usually hollow inside. The middle to upper leaves of second year plants are similar in appearance, but they are smaller in size and more likely to be ovate with margins that are more smooth and petioles that are shorter. The upper stems terminate in small clusters of flowerheads on short stalks. Each flowerhead is about ¾–1″ across, consisting of numerous disk florets and floral bracts that have narrow hooked tips. There are no ray florets. Each disk floret has a corolla that is narrowly cylindrical with 5 slender upright lobes at the apex. The disk florets are usually some shade of pink or purple, although a rare form of Common Burdock with white florets occurs. The slender white style is strongly exerted from the corolla and bifurcated at its tip. The dark purple anthers form a sheath around the style that lies just above the lobes of the corolla. The abundant bracts are green at the base, but become yellowish green toward the their hooked tips. They have a spiny appearance and have few, if any, cobwebby hairs in their midst. The blooming period occurs from mid-summer to early fall, and lasts about a month for a colony of plants. The achenes are oblong, broader and more truncate at one end than the other, and light brown with dark brown speckles. At the apex, each achene has a crown of fine bristles, but these are deciduous and soon fall off. The floral bracts turn brown and enclose the withered flowers at the top, forming a bur. The burs are persistent and remain on the stalks after the leaves have withered away during the fall. The root system consists of a stout taproot that runs deep into the ground. This plant spreads by reseeding itself, and often forms colonies of variable size. Now that you know burdock is a cultivated vegetable, you know you can eat it. The part that is usually sold in health food stores is the taproot. 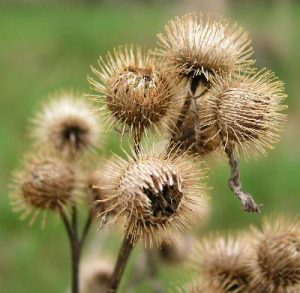 Burdock is usually best harvested before it gets too big, when it is about medium-sized, and before it has turned hollow and fibrous. You’ll want to harvest it in its first year of life. 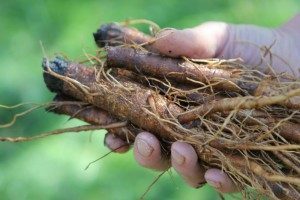 If you harvest a root in its second year while it’s flowering, you will have wasted a lot of time digging up something you won’t want to eat. Like rhubarb, you can eat the young petioles (leaf stems) of burdock. However, you’ll need to carefully scrape off the skin and then cook it. 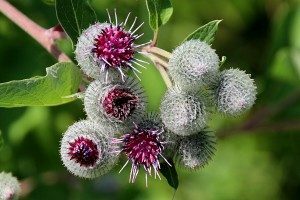 According to Samuel Thayer, the best vegetable that burdock provides is the young flower stalks, harvested when they are 1-3 feet tall and not yet stiff — weeks before the flowers appear. To process them for eating, remove the leaves and side branches and carefully peel off the bitter rind. Once you get down to the whitish inside, you can eat it raw, but it is apparently much better cooked. Once boiled or steamed for a long time, it becomes soft and starchy like new potatoes. For a more detailed look, read: Thayer, S. (2006). The forager’s harvest: A guide to identifying, harvesting, and preparing edible wild plants. Ogema, WI: Forager’s Harvest. Burdock root is a good source of inulin, a type of fiber that has been shown in preliminary trials to improve some glycemic and antioxidant indices and decrease malondialdehyde levels in women with type 2 diabetes. Traditionally, the root has been used as a blood purifier or liver tonic and as a diuretic. It is typically taken as a decoction (a tea from boiling fibrous parts such as root or bark for a longer time) or a tincture (a preparation made by covering plant matter with alcohol and letting it extract over 4-6 weeks). A tea of the leaves has been used topically for skin conditions such as acne, eczema, and psoriasis. 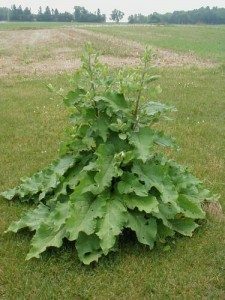 See https://umm.edu/health/medical/altmed/herb/burdock for more information. Burdock’s ample leaves can be used for many tasks out in nature from toilet paper to wiping dishes before washing them. It’s also great forage. South Dakota farmer Sean Hyatt says, “I just find that the animals really enjoy it. I cut up the leaves and feed it to young chicks and ducks before they are big enough to go outside. This gets them started on their forage based diet and teaches them what plants I want them to eat.” And remember those burs? Those burs were the very inspiration for the invention of Velcro.